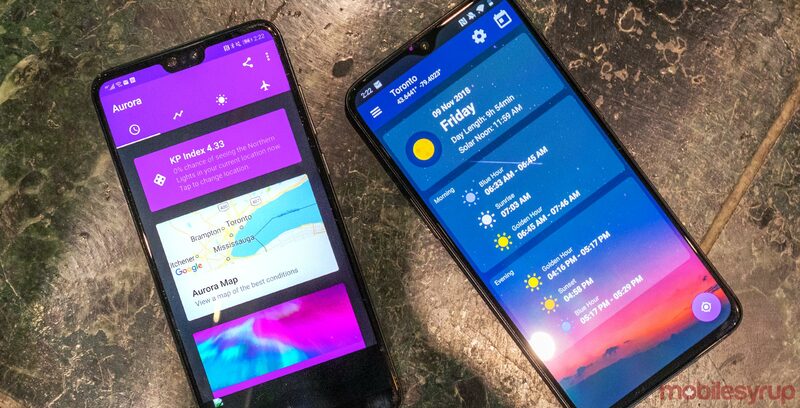 This week for ‘App of the Week’ I’m highlighting two weather-data-based apps that offer helpful tweaks and tips for viewing the Northern Lights and taking photos. The first app is called My Aurora Forcast — Aurora Alerts Northern Lights. The app tells users the best places and times to view the Northern lights. Opening the app presents you with the current KP index, which is a number that ranges from one to nine. The higher the value, the better the chances that you’ll catch a glimpse of the Northern Lights. Below this there’s a map that showcases where the lights might pass over. In Canada, this is generally located in the northern area of the country. There’s also another map that displays the best cities to be in to see the northern lights. There’s another page that shows you the probability of observing the lights within the next 30 minutes, and the cloud cover for that specific day. 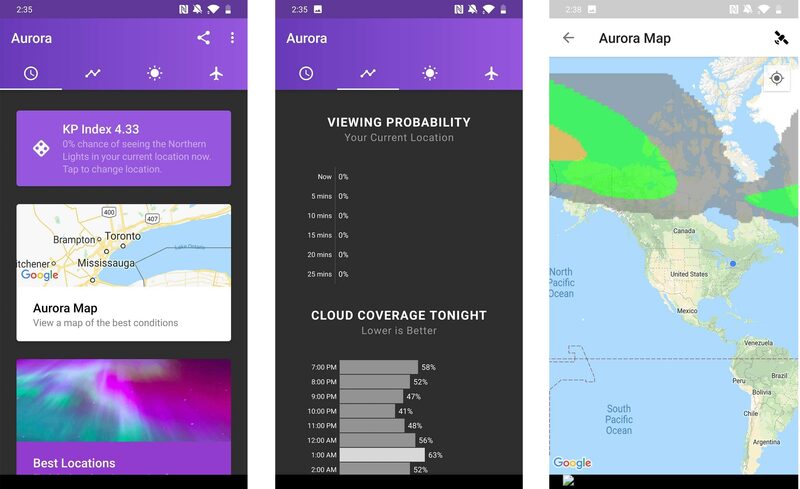 My Aurora Forcast is free on both Google Play and the App Store, but there is a pro version of the app that removes ads that’s priced at $2.89 in the Google Play Store and $2.79 in the App Store. PhotoTime is a useful app for photographers of all skill levels. One of the key photography tips is taking pictures during what’s known as the ‘golden hour,’ a time period right around sunrise and sunset. The golden hours is crucial because as the sun’s rising and setting each day, the light it casts is softer and not as harsh as when the sun is high in the sky. Before the golden hour, there’s the blue hour. The blue hour is useful because the sky casts blue-tinged light, allowing photographers to capture cooler photos. 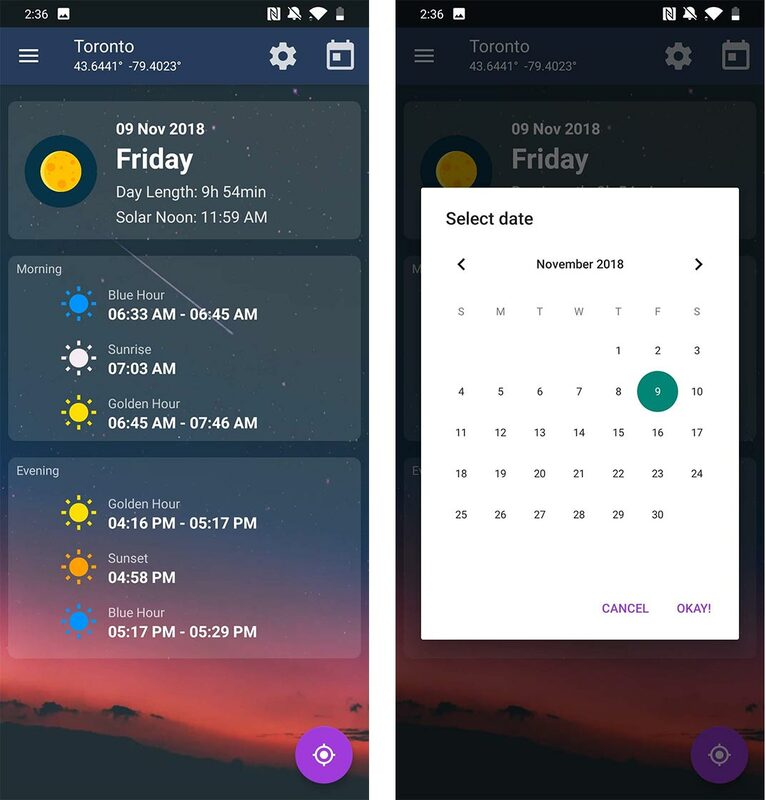 The app defaults to your current location, but you can check out other spots to see when the golden hour, sunrise and blue hour is set to occur. You can even change the day you want to look at, which is particularly useful for planning a photo trip. At the top of the screen, PhotoHour displays the current day, the length of the day and when solar noon is. This is all there is to PhotoTime. It’s the perfect app for someone who likes to take pictures outdoors. The only thing missing is weather data. It would be nice to check out the app in order to find out if it’s raining or not, but realistically there are tons of other apps out there that serve that purpose.